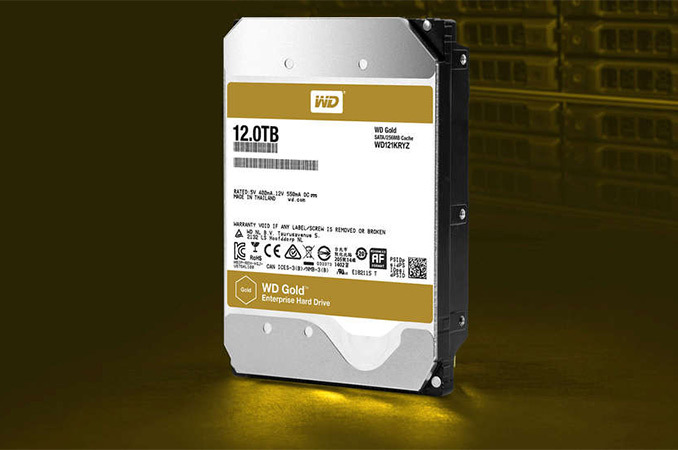 Western Digital has begun to ship its WD Gold HDD with 12 TB capacity to partners and large retailers. The 3.5” drive relies on the same platform as the HGST Ultrastar He12 launched this year, and will initially be available to select customers of the company. The WD Gold 12 TB is designed for enterprise workloads and has all the performance and reliability enhancements that we come to expect, but the availability at retail should make them accessible to wider audiences. From a hardware point of view, the WD Gold 12 TB is similar to the HGST Ultrastar He12 12 TB hard drive: both are based on the fourth-generation HelioSeal technology that uses eight perpendicular magnetic recording platters with a 1.5 TB capacity for each platter. The internal architecture of both HDDs was redesigned compared to predecessors to accommodate the eighth platter. Since the WD Gold and the Ultrastar He12 are aimed at nearline enterprise environments, they are equipped with various sensors and technologies to protect themselves against vibration and as a result, guarantee sustained performance. For example, the WD Gold and the Ultrastar He12 attach their spindles both to the top and the bottom of the drives. In addition the HDDs feature a special technology that increases the accuracy of head positioning in high-vibration environments to improve performance, integrity, and reliability. Finally, both product families support TLER (time-limited error recovery) rebuild assist mode to speed up RAID recovery time. Since the WD Gold 12 TB and the HGST Ultrastar He12 are similar internally and feature the same 7200 RPM spindle speed, they also have similar performance — the manufacturer puts them both at 255 MB/s sustained transfer rate and 4.16 ms average latency. The main difference between the WD Gold and the HGST Ultrastar He12 are the enterprise options for the latter: there are models with the SAS 12 Gb/s interface and there are models with SED support and Instant Secure Erase feature. Western Digital aims its WD Gold and HGST Ultrastar He-series drives at operators of cloud and exascale data centers that demand maximum capacity. The 12 TB HDDs can increase the total storage capacity for a single rack from 2440 TB to 2880 TB, replacing 10 TB drives with 12 TB drives, which can be a major benefit for companies that need to maximize their storage capacity per watt and per square meter. Where the HGST-branded drives are made available primarily through B2B channels, the WD Gold are sold both through B2B and B2C channels and thus can be purchased by wider audiences. For example, boutique PC makers, as well as DIY enthusiasts, may start using the WD Gold 12 TB for their high-end builds, something they could not do with the HGST drives. These HDDs may be considered as an overkill for desktops, but since WD’s desktop offerings top at 6 TB, the WD Gold (and the perhaps inevitable future WD Red Pro 12 TB) is the WD’s closest rival for Seagate’s BarraCuda Pro drives. 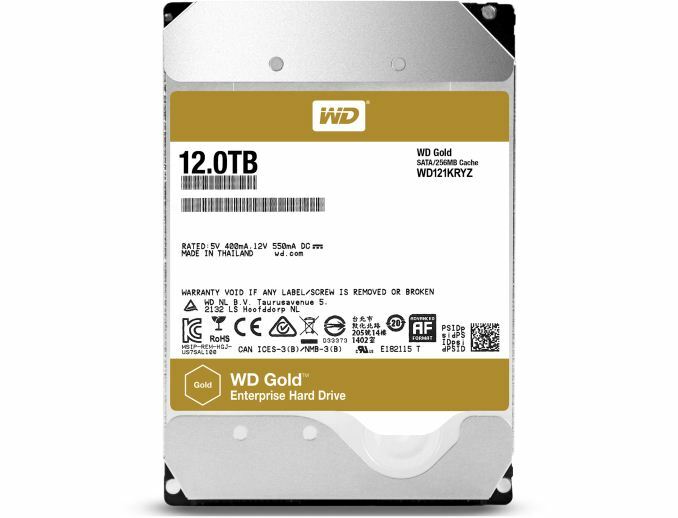 The WD Gold HDD is currently available directly from Western Digital for $521.99 as well as from multiple retailers, including Newegg for $539.99. While over $500 for a hard drive is expensive, it is actually less than Western Digital charged for its WD Gold 8 TB about 1.5 years ago ($595) and considerably less than the initial price of the WD Gold 10 TB drive last April.